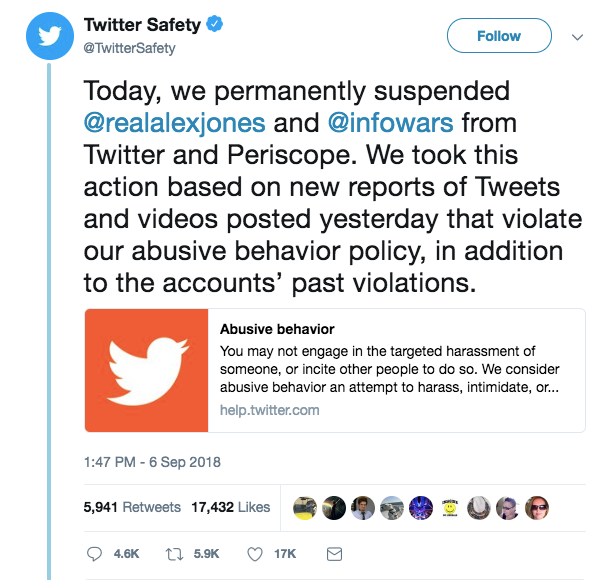 It has been a busy month for Twitter, and Alex Jones, with Jack Dorsey forced to defend the decision not to ban Jones early last month, only reverse course by suspending Jones shortly after a tense Senate hearing on social media. The Senate hearing, in which Dorsey spoke alongside Facebook Chief Operating Officer Sheryl Sandberg, saw the Twitter CEO questioned on his decision not to ban Jones. Shortly afterward, Twitter permanently suspending Jones's verified account as well as that of Infowars. 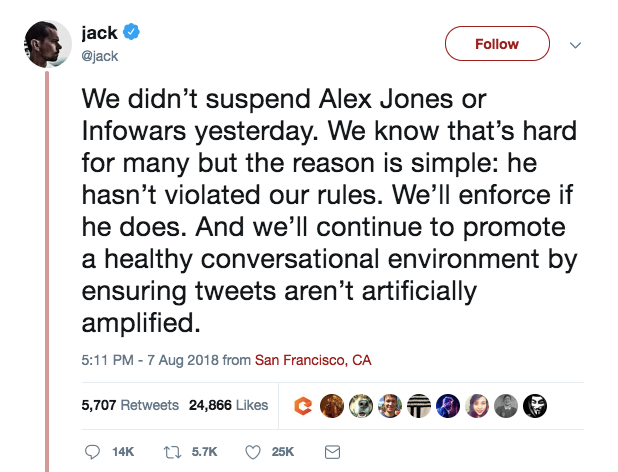 The Tweet is particularly hypocritical, in its bizarre allusion to Jones having committed 'past violations' of Twitter rules, even though Jack Dorsey had been forced to defend the company's policy in regards to not having banned Jones, by stating outright that Jones had not violated Twitter policy. Dorsey reiterated this stance during his testimony given to the Senate concerning Twitter's policy concerning the alleged "Russian meddling" in the 2016 Presidential election. Essentially, in suspending Jones, Twitter is attempting to have its cake and eat it too - but in doing so, the company exposes the enforcement of its rules as both arbitrary and political. This must raise the alarm among those who value free speech in the dawn of a digital age. To break this hypocrisy down, we note that Twitter claims it does not engage in politically motivated censorship by explaining that the reason they had not banned Jones in early August hinged on the fact that Jones had not broken Twitter's rules. Then, in attempting to assert that the subsequent permanent suspension of Jones's Twitter account was likewise not politically motivated, Twitter Support reverses this position, arguing that the ban resulted from not only a recent infringement of Twitter's rules but also hinged on "past violations." So, if the latest Tweet from Twitter Safety is to be believed, one might argue that Dorsey protected Jones based on some type of favoritism despite having violated rules. Or, the latest statement is an attempt to justify politically censoring a dissident voice. In this way, Twitter reveals that its suspension of Jones - and its censorship policy in general - is motivated by political expediency and pressure from the same authorities that interrogated Dorsey on his reasons for refusing to ban Jones just days prior. Disobedient Media has regularly reported on the politically motivated censorship of other figures and journalistic groups, decrying the brief suspension of Caitlin Johnstone, who, (unlike State Department whistleblower Peter Van Buren,) was rapidly "un-suspended" in the face of a massive online uproar after she was initially banned. It is this writer's opinion that the across-the-board escalation in censorship we are witnessing represents the next domino to fall after the gagging of Julian Assange in late March, which has resulted in protests and shows of solidarity ever since, alongside the tightening of technocracy's stranglehold on dissident voices. One positive development in the wake of Jones's suspension was manifested in some legacy press outlets who have finally begun to question silicon valley's role in determining censorship policies on what amount to public forums for the expression of first-amendment-protected free speech. No matter what one thinks of Alex Jones and Infowars, the censorship of any dissident or anti-establishment voice is a cause for grave concern. Disobedient Media will continue to report on such censorship as it occurs.